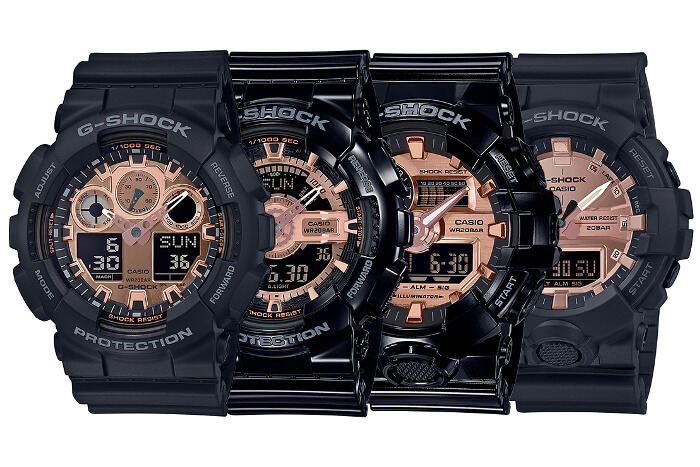 The G-Shock Black and Rose Gold (MMC) Series consist of four analog-digital G-Shock models with metallic rose gold faces and indexes. 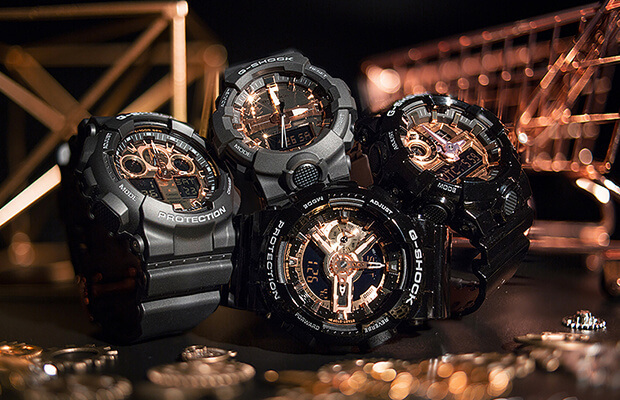 Unlike most G-Shock series that have the same type of finish on each watch, two of these models (GA-100MMC-1AJF, GA-800MMC-1AJF) have matte black bezels and bands and the other two (GA-110MMC-1AJF, GA-700MMC-1AJF) have glossy black bezels and bands. 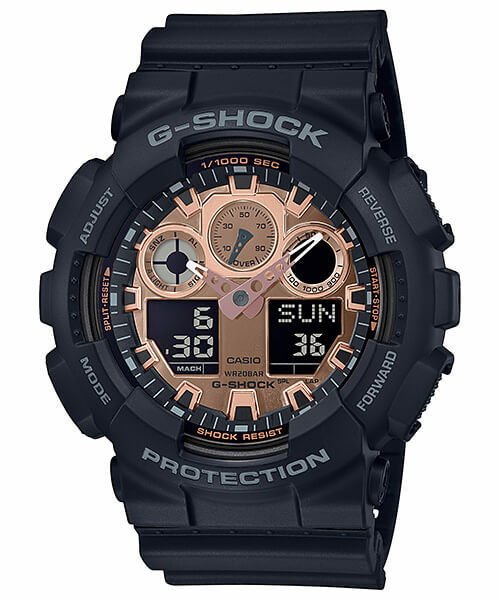 The Black and Rose Gold series is designed with street fashion in mind but as these watches are G-Shocks with 200-meter water resistance and extreme shock protection they can handle any type of outdoor activity. Update: The GA-100MMC-1A, GA-110MMC-1A, GA-700MMC-1A, and GA-800MMC-1A are February 2019 releases in Asia. 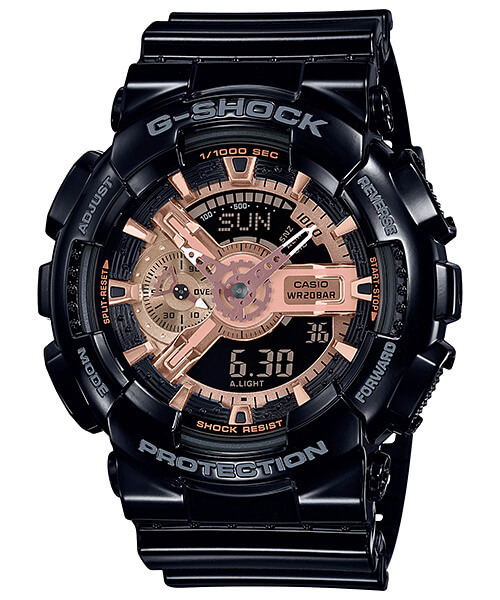 G-Shock GA-100MMC-1AJF: Based on the large case GA-100 with an instrument-panel-style display. Matte black bezel and bands, reverse LCD display. 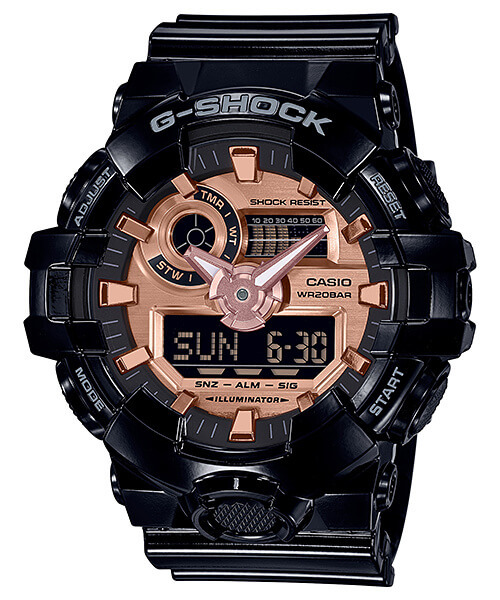 G-Shock GA-110MMC-1AJF: Based on the large case GA-110 with an industrial-style display. Glossy black bezel and bands, reverse LCD display. List price ¥15,000 JPY. List price ¥17,000 JPY. 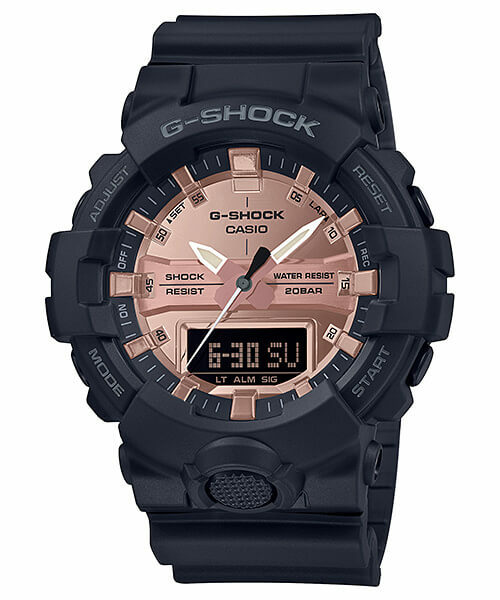 G-Shock GA-700MMC-1AJF: Based on the extra-large GA-700 with 5-year battery and front LED light button. Glossy black bezel and bands, reverse LCD display. List price ¥16,500 JPY. G-Shock GA-800MMC-1AJF: Based on the mid-size GA-800 with three hands, front light button, and one-press stopwatch with 120 lap memory. Matte black bezel and bands, reverse LCD display. List price ¥16,500 JPY.